Kongma Tse Peak (56849m.) 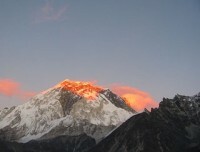 which is also known as Mera peak is situated in the Everest region north of Kongma-la above the Khumbu Glacier. 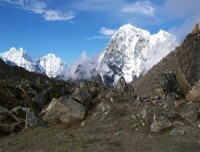 It is opposite of Lobuche that make up the long South-West Ridge of Nuptse between Nuptse glacier and Khumbu glacier. This peak was opened and issued permit for climbing in 2002. It is a rarely climbed peak of the Everest region. From the summit one can enjoy the excellent view of the mountains like Mt. Everest (8850), Nuptse, Lhotse, Makalu, Baruntse, Ama Dablam, Pumori etc. it is more approachable from the south of the mountain. From the lakes east of the Kongma La, we can see the steeped glacier flowing down between long south and south east ridges. The border of the glacier is the normal route to ascend the peak. It is not very technically difficult to climb the peak and does not require the previous experience. The journey of Kongma se peak climbing begins with the scenic flight from Kathmandu to Lukla. The journey from Lukla to the base camp of the Kongma La peak is an exciting experience to the climbers. The trekking provides the combination of natural cultural experience to the climbers. The beautiful landscapes, views of waterfalls, cascading down of the rivers and its valleys, beautiful forest with blooming rhododendron flower, various Sherpa settlements on the way provides the overwhelming experience to the climbers. En route you traverse through beautiful monasteries, Sherpa villages, Sagarmatha national park etc. in the world heritage Sagarmatha national park you can explore various types of flora and fauna and encounter wild animals and birds. Day 08: Machharmo to Gokyo (4790m.). Day 17: Trek to Lukla (2840 meters) 7 hours. Day 18: Morning flight back to Kathmandu. 30 minutes. Day 19: Leisure day in Kathmandu. Although it can be customized by request to accommodate your specific needs. The above itinerary is only a guide line; it might change due to fluctuating weather conditions, availability of lodging and campsites, unforeseen political, trail and environmental or any other factors beyond our control. In this happen, your Nepal Hiking Adventure guide/leader will choose the best way to the final decision on the best alternative after consulting with the group. At last if the itinerary will be not suitable for you please do let us know and will make a tailor-made on it. The itinerary will be very flexible from our side if clients want to change will be possible. Day 03flight to Lukla and trek to Phakding In the morning you have a scenic flight of 30 - 35 minutes to Lukla (2800m.) from Kathmandu. During the flight you can see the snowcapped mountains and greenery field below. From Lukla we start our walk and head to Phakding passing through the forest and following Dudh Koshi River. In Phakding you can climb to the gompa to see your first view of the high peaks. O/N at Phakding. Day 04Phakding to Namche Bazaar (3440m.) From Phakding the trail follows the Dudh Koshi River and reaches Zamphuti. From there we can see excellent views of Thamserku peak. Then the trail climbs to Chomoa, the site of an agricultural project, an interesting place to have a look around and gain an insight into the farming way of life of these people. From Chomoa, the trail again climbs to Monjo (2840m.) and enters the Sagarmatha (Everest) National Park (1148sq km, established in 1976). Walking some distance uphill you will be at Jorsale (2830m.) and after a long climb with views of Mt. Everest peeking over the ridge of Nuptse (7879m.) the trail reaches the street of Namche Bazaar. Stay at Guest house- Lunch, Dinner and Breakfast. O/N at Namche Bazaar. Day 05Acclimatization in Namche (3440m.) today we take rest for the proper acclimatization with some excursion. We can hike to the Everest View Hotel, the ideal place to overview some of the outstanding mountains such as Mt. Everest, Ama Dablam, Thamserku, Lhotse etc. You can walk around the Khumjung valley, Hillery School and Khunde Hospital and then return back to Namche. In Namche Bazaar you can spend some time interacting with the fun-loving Sherpa and Rai people. Day 06Namche to Dolle (4000m.) From Namce we continue our trek. At first we walk along the easy trail ascending to the pass through the pasture. Then we steeply descend to the River known as Phortse and again ascend to Dolle for 3/4 hours. Day 07Dolle to Machharmo (4300m.) This day also we ascend through the yak pasture and finally reach Machharmo where we stay overnight. Day 08Machharmo to Gokyo (4790m.). Today the trek takes us at one of our final destination, Gokyo (4790m.). We climb through a ridge Chorten from where we can see fabulous view of both down the valley and of the Mt. Kangtega, Thamserku, and northern part to the Cho-Oyu (8153m.). Day 09Trek to Tangnang (4500m.) This day we trek to Tangnang towards Chola Pass. It takes about 4 hours to reach Tangnang walking up hill. Day 10Tangnang- Dzongla (4900m.) This day early in the morning we start our trek. From Tangnang we head to the pass and cross the pass. Then we descend to the Dzongla where we stay overnight. Day 11Dzongla to Gorakshep From Dzongla we trek to the Gorekshep. Day 12Gorakshep to Lobuche (4800m.) This day we hike up to Kala Pattar. From Kala Pattar we can see the most magnificent mountain panorama of Everest, the highest point on the planet at 8848meters, towers directly ahead and other giants, Nuptse, Pumori, Chagatse, Lhotse and countless others. Then we return to Lobuche. Day 14Climb the peak and return to Chukkung This day we achieve our goal of climbing the peak. From the peak we can see the beautiful view of the excellent view of the mountains like Mt. Everest (8850), Nuptse, Lhotse, Makalu, Baruntse, Ama Dablam, Pumori etc. we finally return to Chukkung. Day 15Chukkung to Tengboche We return to Tengboche, a beautiful Sherpa village where you see the world highest Monastery. Day 16Trek to Namche (3440 meters) A steep descent to the Dudh Koshi and another climb up to Namche Bazaar. Overnight at guesthouse. Day 17Trek to Lukla (2840 meters) 7 hours. Finally we return to Lukla where the trek began, which will seem like a lifetime ago. Enjoying time to reflect on the trek as a group and the personal achievement of all those who took part. Also giving you time to explore the town. Overnight at guesthouse. Day 18Morning flight back to Kathmandu. 30 minutes. Enjoying your last glimpse of the mountains you have recently visited for one last time on the 35 minute Scenic flight back to Kathmandu. On arrival in Kathmandu we are met and transferred back to our starting hotel. Overnight at hotel. Day 19Leisure day in Kathmandu. It's also spare day in case of bad weather in Lukla. Day 20Departure. The trip ends, our Airport Representative will drop you to the Kathmandu International Airport for your flight departure from Nepal.